320 pages | 49 B/W Illus. The Open Access version of this book, available at http://www.tandfebooks.com/doi/view/10.4324/9781315401867, has been made available under a Creative Commons Attribution-Non Commercial-No Derivatives 3.0 license. This book brings together academics, members of European institutions, and regional and national level policymakers in order to assess the performance and direction of EU Cohesion policy against the background of the most significant reforms to the policy in a generation. Responding to past criticisms of the effectiveness of the policy, the policy changes introduced in 2013 have aligned European Structural and Investment Funds with the Europe 2020 strategy and introduced measures to improve strategic coherence, performance and integrated development. EU Cohesion Policy: Reassessing performance and direction argues that policy can only be successfully developed and implemented if there is input from both academics and practitioners. The chapters in the book address four important issues: the effectiveness and impact of Cohesion policy at European, national and regional levels; the contribution of Cohesion policy to the Europe 2020 strategy of smart, sustainable and inclusive growth; the importance of quality of government and administrative capacity for the effective management of the Funds; and the inter-relationships between institutions, territory and place-based policies. The volume will be an invaluable resource to students, academics and policymakers across economics, regional studies, European studies and international relations. 4 Econometric assessments of Cohesion Policy growth effects: how to make them more relevant for policymakers? 14 Efficient implementers and partners: what do we miss in our understanding of how Cohesion Policy administrators work? 18 What institutional arrangements exist to ensure coherent EU Cohesion Policy planning and implementation? 19 Integrated territorial investment: a missed opportunity? John Bachtler is Professor of European Policy Studies and a Director of the European Policies Research Centre at the University of Strathclyde in Glasgow, UK. Peter Berkowitz is Head of Unit for Policy Development, Strategic Management and Relations with the Council in the Directorate-General for Regional and Urban Policy in the European Commission, Belgium. Sally Hardy is Chief Executive Officer at the Regional Studies Association, UK. Tatjana Muravska is Professor in Regional Economy at the University of Latvia and Director of the Centre for European and Transition Studies, Latvia. 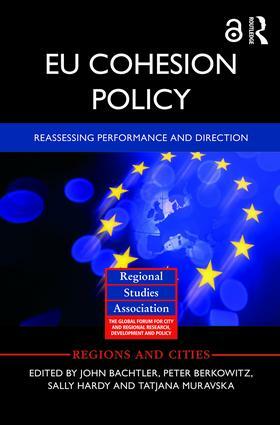 Download EU Cohesion Policy: Reassessing Performance and Direction, edited by John Bachtler, Peter Berkowitz, Sally Hardy, Tatjana Muravska — a new open access monograph from Routledge and the Regional Studies Association. Find out more about our open access publishing and browse all available open access titles on our eBooks site.